What do you value the most in LMS apps when creating another assignment for students or grading their papers? 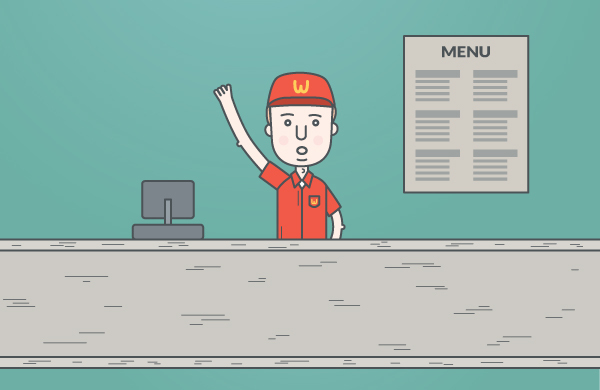 One of the choice criteria is sure to be its “labor-saving” feature. This is what our team calls “striving for a positive user-experience at all costs.” And this is the main reason why a new Unicheck update has been released. It allows saving settings for all assignments in a course with just one click. This way you avoid adjusting settings for each assignment individually. Isn’t it labor-saving? How to Use the Newly Rolled Out Feature? 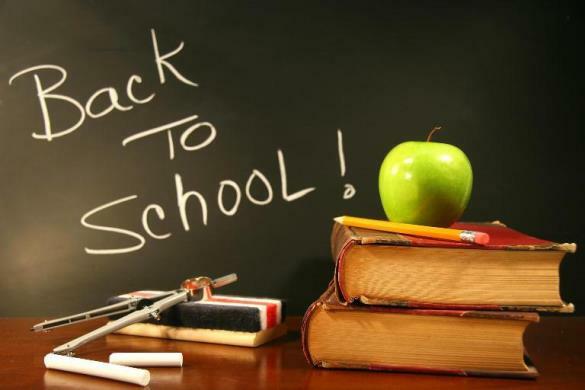 Accessible to all educators checking student papers with Unicheck in their LMS accounts, this feature was primarily designed to facilitate your daily work when creating another assignment in LMS and save a great deal of your precious time to have more coffee breaks or friendly chats a day. 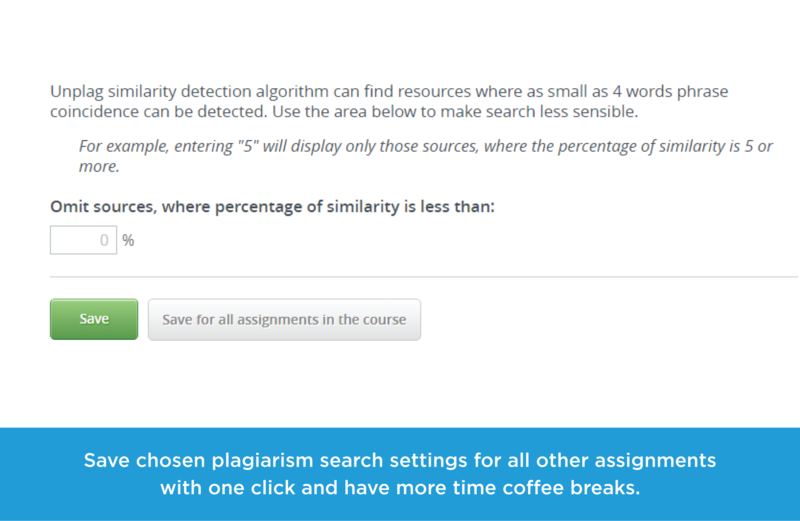 Adjust plagiarism search settings only once and apply them to all other assignments you create in a course. How? Click the Save for All Assignments in the Course button as shown on the screenshot below. How Else Can You Benefit from the Feature? When integrated with your LMS, Unicheck can be accessed by the admin of your academic institution too. Earlier after copying a course it wasn’t possible to choose settings to be applied for all assignments in it. But now the admin can do this. 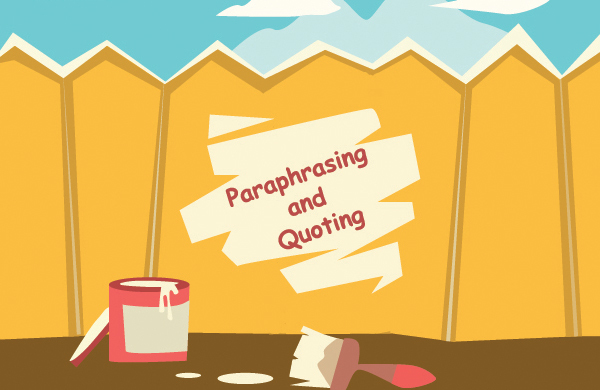 The steps to be followed are simple: copy a course, enable necessary settings for any of the assignments, and save chosen plagiarism search settings for all of them. 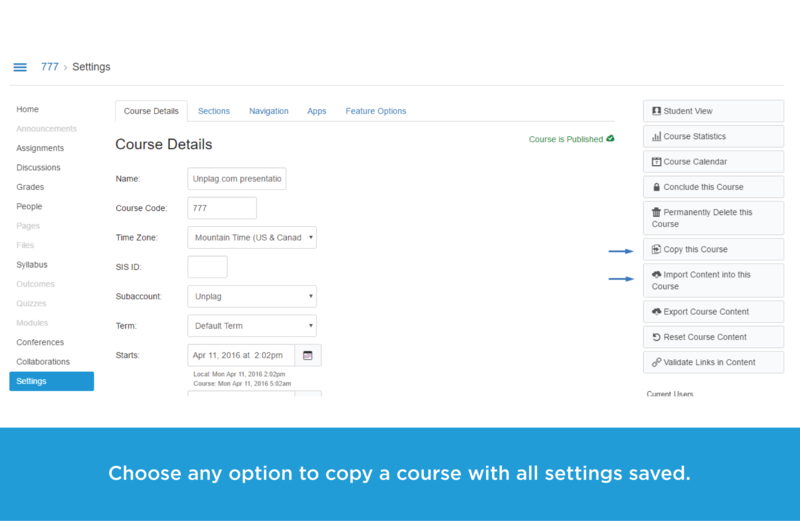 To copy a course content, your admin can choose either of the two suggested options as demonstrated on the screenshot. What Other Updates Have We Launched so Far? We do our best to be responsive and implement new system updates as soon as possible for you to feel more at ease when using the Unicheck functionality. Here’s what our team has also managed to do. Keep following us to be timely informed about all recent upgrades! Still Keep Guessing Whether a Student Re-used a Paper? Unicheck Can Clear Up Your Doubts! Adaptive Learning Is a New Educational Trend. Guess Why?